What do you do when it’s Winter Break, you live in frigid Michigan, and you have an eight-year-old daughter in love with American Girl dolls? 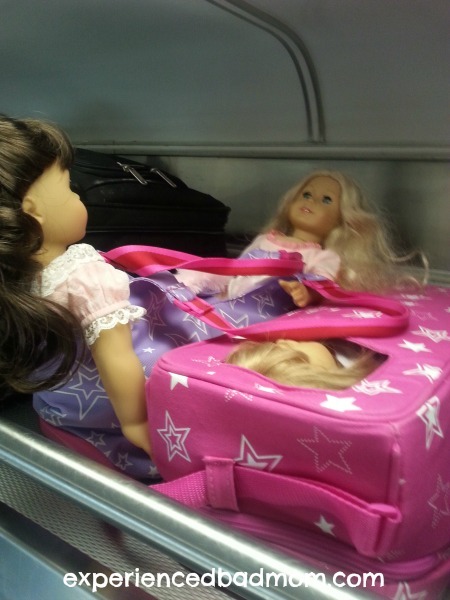 Why, you travel to American Girl Place in Chicago, of course! Which is what the EBM family did a couple weeks ago. Many of you recall that I also have a son. “How could you take him to American Girl? What kind of mother are you?” you’re asking. Well, I figured that my eleven-year-old would also enjoy the trip to Chicago if we promised him Legos and candy. PLUS (<— and that’s a very big PLUS) his little sister has been dragged to 3,871 of her brother’s hockey and baseball games. 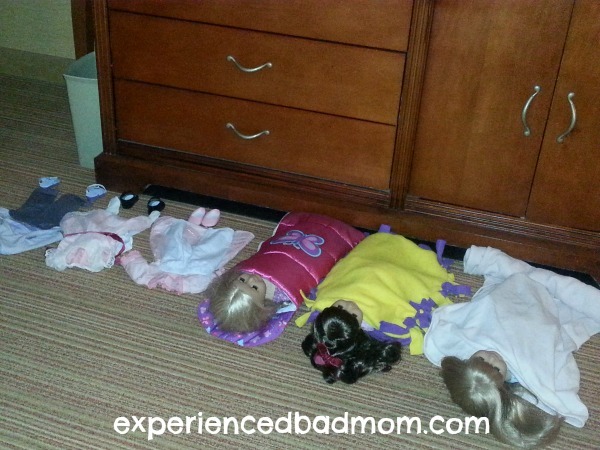 She can have a short trip to American Girl Place! We had such a good time on our trip that I’m mostly going to let the pictures do the talking. We waited a few minutes for the doors to open at 9 am and rushed to the doll salon (which is on the top floor of the store in Chicago). 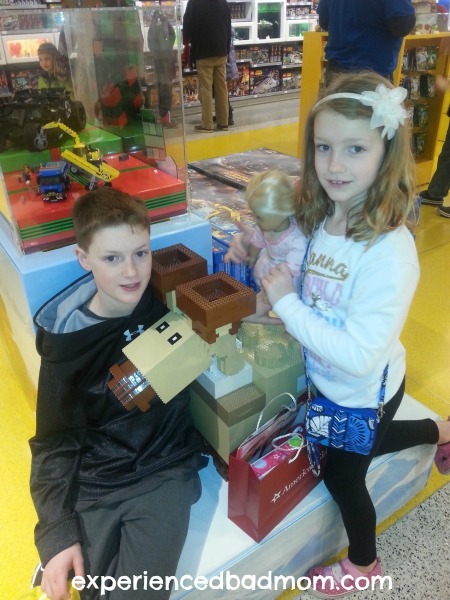 Tip: For the quickest path to the doll salon, wait at the entrance door by the Lego Store. We were second in line and got Caroline Abbott’s curls restored ($10) and my daughter’s look-a-like doll, Sparkle, styled with braids and ribbons ($20). Yes, it’s sort of crazy to pay for doll hair styling, but those of you who have curly haired dolls know it’s worth every penny. And the braids with bows hairstyle on Sparkle turned out super cute and made my daughter happy. Tip: appointments are booked in 15 minute increments. I suggest you go to the salon first thing to get your appointment scheduled! Next we browsed the store. I loved the Chicago store’s free coat check as it meant we weren’t lugging our coats around. Tip: the coat check is located on the first floor by the concierge desk. At 10:45 we met my husband and son outside the cafe when it was time to check in for our 11 am dining reservation. The waiting area to check in for seating is crazy. No nice way to say it. Kinda like your worst wait in line for a ride at Disney World! Tip: reservations are available online or by phone 2 months out. Book as soon as you can! Once inside the cafe, we were seated at a lovely table by the window. My daughter was thrilled that each of her three (!) dolls got a chair to sit with her at the table. Each doll also got a tea cup and plate that we could keep. Plus, the napkin rings were American Girl hair ties that we could keep, too. I loved the cafe’s elegant decor and the food wasn’t half bad either. For our lunch, we started with cinnamon rolls, then a fruit, cheese, and vegetable plate. Main dish selections included pasta and sandwiches for the adults and kid-friendly fare like chicken tenders. Everyone gets a scoop of ice cream for dessert. We sprung for the birthday package, too, which was an additional $10 for the birthday girl and $3 for each of us. Totally worth it, if you ask me! It included crowns for the birthday child and dolls, birthday cake, and a goody bag with a doll shirt, balloon, and activity book. My daughter loved it and we loved celebrating her 8th birthday once more. After lunch, it was back to shopping for the girls while the men wandered around Water Tower Place, a huge indoor mall. 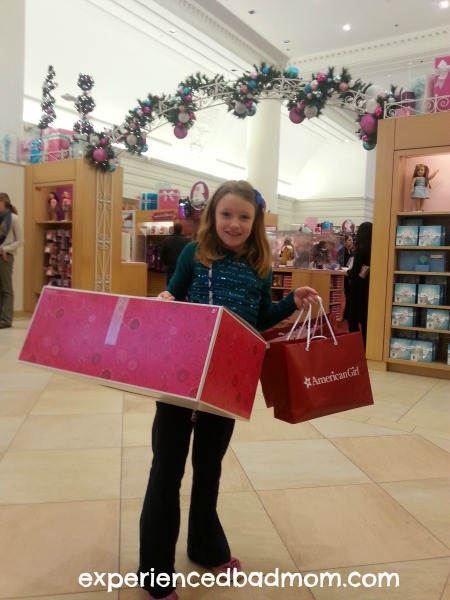 There is so much to see at American Girl that it can be overwhelming. My daughter actually broke down in tears at one point because there was JUST. SO. MUCH. And she wanted it all! But, unless your last name is Trump or Rockefeller, you can’t buy it all. She settled on using her Christmas gift cards to buy the gymnastics set. I treated her to the leotard – plus a pair of purple platform sandals. Finally, we joined her brother and father at the Lego store conveniently located next door. We had a great time! Have you been some place special with your family recently? I’ve been, twice. I took her to the one in NYC for her 6th birthday last summer. 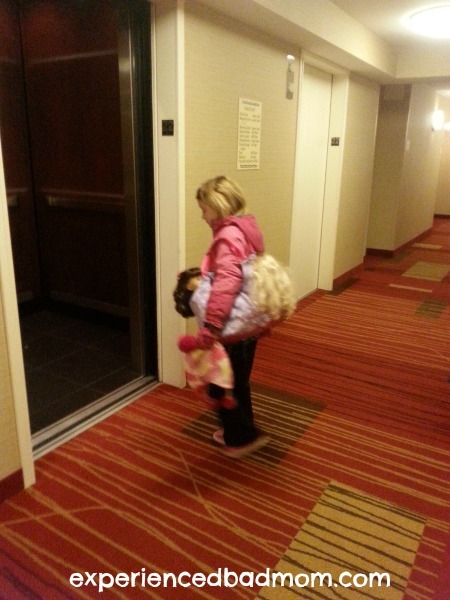 As I’d been waiting for 6.5 years (ever since i found out I was having a girl, I had been planning this trip), I cried when we walked in and she was enthralled. We went early so it wasn’t too insane. She got to pick a doll and an outfit, and her grandmother bought her some stuff too. Of course she picked Caroline (despite me pleading for a straight haired doll). So, our second trip was to the store at Tyson’s Corner, where we got Caroline’s hair done and had tea. The tea was a blast. I highly recommend it. We went on a Friday that was a half day so it wasn’t quite as crazy as it is on a weekend. That’s my best tip – pick a weekday when your school system is out of school for a random reason like “teacher planning”. I’m so glad it was special for you, too! Great memories. And, yes, good tip to try to go on a random day. I thought I had a random day (January 2) because it was after the holidays. Little did I realized in September when I planned it that it would be a crazy day due to the release of Grace, the American Girl doll of 2015! Oh well, it all worked out great anyway. Wow! What an exciting birthday! My daughter would be in heaven!! How sweet. My daughter loves that store. We ate in the cafe too. This sounds like such a fun time! I miss Chicago, now that I’m faraway I wish I would have taken more advantage of our time there. 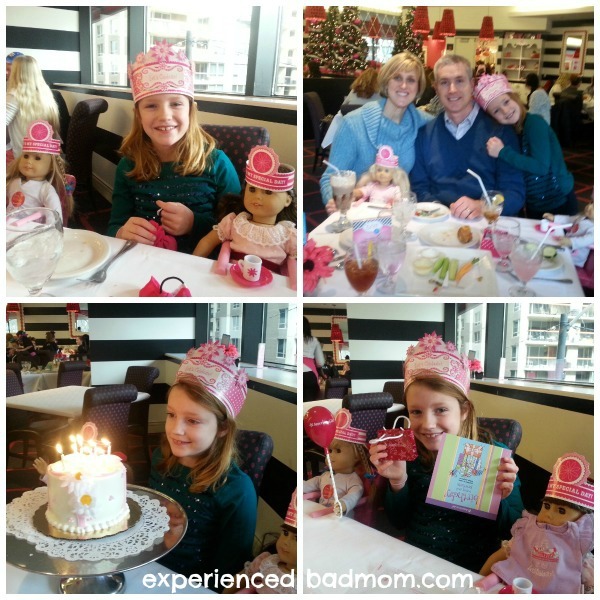 I never took my girls to American Girl Place, I wish I would have. I imagine planning and going super early is the best idea, it always seemed quite busy. I’m glad you and your family have this beautiful memory. The Lego Store is AWESOME!